If you have a pet, then you know how absolutely important it is to accessorize your little (or big!) friend. Pets often become members of our family! They deserve to be spoiled a little with some personalized accessories. This pet / dog leash is the perfect way to really give your pet's accessories some pizzazz. The leash is 72" long. This is the perfect size for a large or small pet. The material is a strong black nylon weave. It is sturdy enough for any tugging or pulling done by your furry friend. The leash is one continuous piece that is sewn over to have a large handle at the top. The metal clasp at the end is a typical medium sized bolt snap for pet leashes. There are two spots for personalization where you are able to pick a fun pattern and print your pet's name. There is one towards the top of the leash and one towards the bottom. 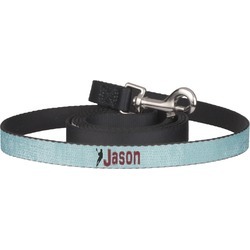 Now personalize your pet's leash! Choose their favorite pattern or color. Pick something that really fits their wagging personality! If you ever need any assistance in our design center please don't hesitate to give us a call. We are always happy to help!